By now, you've heard of all the color trends that are supposedly on the quest to dethrone millennial pink. Whether it's Gen Z yellow, melodramatic purple, or safety orange, there always seems to be one color that you start seeing everywhere until it slowly infiltrates your wardrobe. The newest shade to join the ranks of this colorful crew? Pale blue—especially among dresses this fall. Maybe it's because as the days grow colder, we'll yearn for the clear blue skies of a summer day, or maybe it's because we aren't afraid of experimenting with a paler shade among autumn's typical red and yellows, but we're welcoming this fresh hue with open arms. Ahead, find 25 dresses that are a good place to start for incorporating this color into your wardrobe. Pale blue looks best with a dainty floral print. The contrasting buttons are a lovely touch to this barely there blue. A pale blue T-shirt dress is always a must in our books. A pale blue dress will become your PVC accessories' best friend. Breeze into fall with this draped pale blue dress. A perfectly placed slit will elevate your look instantly. Cool comfort in a dress. Perfect to layer over fun-colored tights. Perfect for all those fall holiday parties. Master a chic boho look with this kimono-sleeve dress. Take this wrap dress from work to a night out with your friends. The shiny pale blue dress of our dreams. This number is all about its ruffle detailing. Layer this dress over (or under) your fall sweaters, and you're good to go. A classic silhouette (and color) for any occasion. Doesn't get more romantic than this dress. 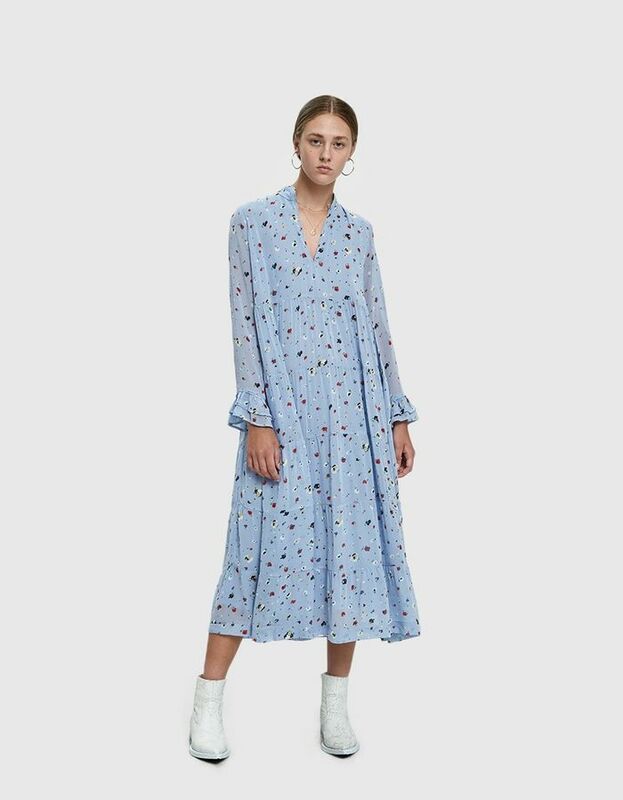 Wear this dress with heels or sneakers. If you're attending a fall wedding, this dress is for you. Is there something more romantic than pale blue lace? Style this shirtdress under your classic trench. Imagine how well this dress will look with those cowboy boots you're dying to try. Stock up now before it's too late.